The locomotive has a digital decoder and extensive sound functions. It also has controlled high-efficiency propulsion with a flywheel. 6 axles powered. Traction tires. The locomotive has an articulated frame to enable it to negotiate sharp curves. The triple headlights and a white marker light (Swiss light changeover) change over with the direction of travel, will work in conventional operation, and can be controlled digitally. Maintenance-free warm white LEDs are used for the headlights. The locomotive has separately applied metal grab irons. Brake hoses are included separately. Length over the buffers 16.2 cm / 6-3/8". Digital decoder and extensive operating and sound functions included. 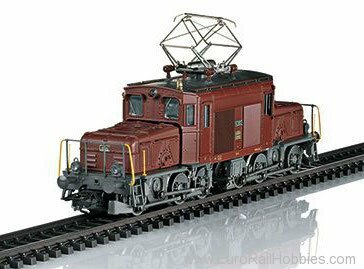 This model can be found in an AC version in the Märklin H0 assortment under item number 37511. "Seetal Crocodiles" The lines for the Swiss Seetal Railroad near Wildegg and Beromünster were electrified from 1910 to 1930 with 5.5 kilovolts / 25 Hertz current, a leftover from the private railroad era. When the railroads were nationalized in 1922, the SBB took the simultaneous decision to standardize the system of current for powering locomotives and to purchase a new locomotive. Hence, in 1926 three of the class De 6/6 were already equipped for the standard current of 15 kilovolts / 16 2/3 Hertz. The "Seetal Crocodile" lives up to its name: The design for its frame is quite similar to that of the famous SBB Crocodiles. Two groups of driving wheels (here without pilot trucks) support a three-part body. Since the Seetal locomotives had to be more maneuverable and lighter, suitable mechanical parts were used from the small class Ee 3/3 switch engine built at the same time. Each power truck frame is driven by a motor via a jackshaft and diagonal side rods, the whole putting out 850 kilowatts or 1,140 horsepower, and enabling a top speed of 50 km/h or 31 mph. A characteristic feature of these units are the large air intakes on the appliance side of the locomotive for cooling the transformers, and the single pantograph. These three small Crocodiles were in use on the SBB until 1983, since the 1950s primarily as switch engines. Road numbers 15302 and 15303 were scrapped in the spring of 1983. Road number 15301 came to the Oensingen-Balsthal Railroad, where it was used for another 10 years as a freight locomotive. This single preserved locomotive is maintained at present by the "Seetalkrokodil 15301" Association.